By administrator in IMC Exploration Group (IMCP) on 15th February 2016 . 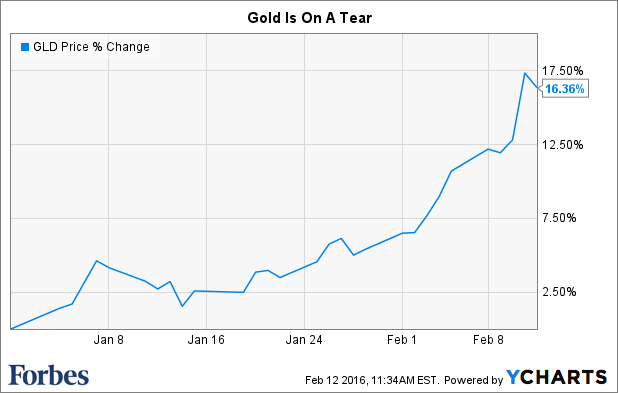 Gold is having a moment. The precious metal surged 6% last week, and is up 16% this year, as global market turmoil has prompted nervous investors to rush into what they view as a safe haven investment. “The strong rally in gold highlights the fear that currently permeates through financial markets,” said IG analyst Joshua Mahony. Last week alone, investors ploughed $1.6 billion into precious metals (which includes gold as well as silver, platinum and more), according to Bank of America Merrill Lynch. In the last five years, there has only been one other week with bigger inflows into the shiny stuff. “Investors are returning to gold as a core diversifier and safe haven investment,” said James Butterfill, head of research at ETF Securities. Markets have tumbled this year as investors are spooked by plunging oil prices, a slowing Chinese economy, the strong dollar and uncertainty over interest rates. This week, Janet Yellen sparked fresh concerns over the Federal Reserve’s decision to raise interest rates when she didn’t rule out the possibility of negative interest rates.